After Maro – Lies! Lies and Slander! Mr. Rosewater, it’s me, Robby from M:tGColorpie. No, I do like Exalted. I was waiting for the explosion and the “Bew bew sounds” but it sounds like you like it. Good. (Beat) I’m sensing a problem. Ah, the Force is strong in this one. It’s not your preview that I’m upset about. Now, come on, I did a preview that was more than a Timmy card. I understand, but you broke one of your rules. Rules? I break rules all the time when it comes to card design. Even Planeswalkers, and Mythic Rares. Now wait a minute, we never said the Mythic Rares weren’t going to be bad, just not utility cards and staples. Sure, you were saying that duel lands weren’t going to be Mythic, and now they’re not going to be rare? But we threw a bone to budget players. There’s enough mana fixing for everyone right now. Yes, and I appreciate that. Then what’s your beef? You seem to be agreeing with what I’m saying so far. Well, I guess it’s not a rule, but a principle. Go read Principle 6 for creating Planeswalkers. In fact, let me read it for you. “Principle 6) They must work well in any deck against an opponent’s deck.” Remember that fact? Tezzeret, the Seeker deals with artifacts. Not every Blue deck has artifacts in it. Then they shoudn’t play Tezzeret then. +2: Untap all artifacts you control. -1: Search your deck for an artifact and put it into your hand. Then he would be very appealing for heavily artifact-focused decks, but wouldn’t do anything at all in the vast majority of random blue decks. That would be awful—we made it a priority to have these guys play well no matter what your deck does. But Blue’s main shard is all full of artifacts. He’s from that plane! Doesn’t that make sense? “Principle 11) Their abilities don’t explicitly mention what world they’re in.” Ajani’s new card doesn’t say he’s from Naya. He’s not even Green. Garruk’s ability deals with creatures. Green is known for its creatures. Chandra deals damage, something’s Red’s good with. Why can’t a Blue Planeswalker deal with artifacts? There’s a different between untapping artifacts, and tutoring for them and putting them into play. Remember Tinker? Remember it? I designed it. Exactly. There’s a difference between untapping a Signet for mana, and searching for a Disk, or Top before you banned it, and putting it into play. You have to build your deck around the Planeswalker to make it function. Two principles are broken the second time we see Planeswalkers. Did it ever occur to you that we did this because we’re evolving the card type. We can’t have every Blue Planeswalker draw cards and mill. Blue is the card most associated with artifacts. Why are you bringing this up now? One, I wasn’t on the design team so I couldn’t have said anything then. And two, the Planeswalker reviewed on Monday created dragons. You’ve got dragons as one of your main creature types on one of your shards. And in the Planeswalker Guide to Alara (in bookstores now), he’s not even from that plane! So? Dragons are found all throughout the Multiverse. But maybe you shouldn’t create a Planeswalker where it creates tokens that are excatly the same as the biggest creatures on a plane in the same set. Sure, having a dragon give your spark is great, but it could have waited until the set of Planeswalkers. But this fits into the flavor. Why not have a Planeswalker who creates creature tokens that are found on every plane, but fits in one that embraces them? Sigh, I can see your point, but I’m not happy with it. Will you still buy packs? 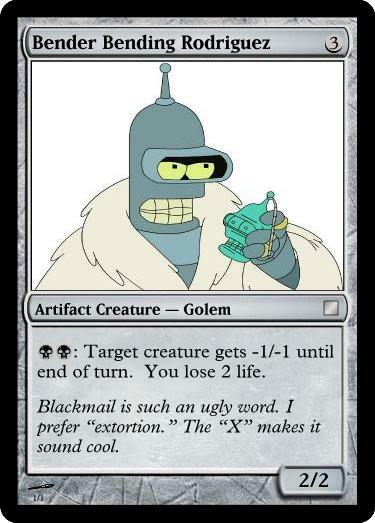 Bender Bending Rodriguez’s creature type should be “construct” not golem.